“IT TAKES AWHILE to grasp, because it is so different,” said developer Wayne Ratkovich. Preliminary plans call to replace four old buildings on the LACMA campus with a 400,000 square-foot exhibition hall, one-quarter of which would stretch over the boulevard. While cars drive east and west below, gallery goers can look down from above. 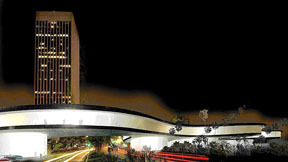 The transparent, bridge-like structure would be raised 30 feet off the ground, stand on glass cylinders and reach an existing parking lot on Spaulding Ave.
“It’s very innovative in terms of going across Wilshire Blvd.,” said Wayne Ratkovich, president and CEO of the Ratkovich Co., and owner of an office tower at 5900 Wilshire. A model of the design is at LACMA’s offices located in his building. “It takes awhile to grasp, because it is so different. I think the architect Peter Zumthor is one of the great architects today,” Ratkovich added. Earlier plans by the Pritzker-prize winning Swiss architect were scrapped after officials and paleontologists at the Page Museum at the La Brea Tar Pits objected to its dark, ink block shape that overlapped and shaded some of the area’s tar pits. The area is a world-renowned Ice Age fossil excavation site. Zumthor went back to the drawing board and returned with his out-of-the-box design—adding open-air courtyards, and he moved the new building away from its renowned neighbor. The $650-million project would replace three 1965 William Pereira buildings and a 1986 addition by Hardy Hozman Pfeiffer. The Japanese Pavilion and recent Renzo Piano structure would stay. City officials have also given the initial design a thumbs up.